Release of liability is basically an agreement that allows an individual or business to release liability arising from any event in consideration for an asset or cash payment. The legal areas that come under this agreement include real estate, labor and employment, immigration, security and finance, business operations and more. Paintball Release of Liability Waiver Form How to Write a Liability Waiver? “Participant”) and __________________________[PLEASE PRINT PARENT/GUARDIAN NAME], the parent having legal custody and/or the legal guardian of the Participant (the “Guardian”), in favor of the Liability Waiver, Inc. (“LW”), INC., a nonprofit corporation and its directors, officers, employees, volunteers and agents (collectively “Releasees”). The Participant desires to volunteer at programs and activities conducted by the LW. As used in this Release, the terms “Volunteer”, “Participate” and “Participation” are intended to be used in their broadest sense and shall include any and all activities of any kind or nature, at any time and in any place that is performed by the Participant with the LW. 1. Waiver and Release. Participation does hereby release and forever discharge and hold harmless LW and its successors and assigns from any and all liability, claims and demands of whatever kind or nature, either in law or in equity, which arise or may hereafter arise from Participation. Participant understands that this Release discharges LW from any liability or claim that the Participant may have against LW with respect to any bodily injury, personal injury, illness, death, disability, property damage, incidental or consequential damages, punitive damages or special damages that may result from Participation, whether caused by the negligence of LW or its officers, directors, employees or agents, other LW volunteers, or otherwise. Participant also understands that LW does not assume any responsibility for or obligation to provide financial aid or other assistance, including but not limited to, medical, health or disability insurance except as LW has specifically disclosed in writing to the Participant. 2. Medical Treatment. Participant does hereby release and forever discharge LW from any claim whatsoever which arises or may hereafter arise on account of any first aid, treatment or service rendered by any person in connection with Participation. 3. Assumption of the Risk. Participant acknowledges that there are potential hazards (“Hazards”), known and unknown, involved in Participation. The term “Hazards” is intended to be used in its broadest sense and includes, but is not limited to natural hazards (land, weather, etc.) and man-made hazards (concrete, steel, etc. ), food contamination, as well as hazards typical for playing gaming equipment and competitive games. The Participant understands and acknowledges that participation may include Hazards that could harm the Participant, and that such Hazards may or may not always be obvious. Participant hereby expressly and specifically assumes the risk of injury or harm for all such Hazards and releases LW from all liability for injury, illness, and death or property damage resulting from Participation. 4. Insurance. LW may elect, in its sole discretion, to provide group accident insurance for special projects. Any coverage so provided will be governed by the policy language. Except to the extent it makes available such group accident insurance, LW does not carry or maintain, and expressly disclaims responsibility for providing any health, medical or disability insurance coverage for the Participant. Participants are not to be deemed employees or agents of LW and LW shall not be responsible for the purchase of worker’s compensation insurance. EACH PARTICIPANT IS EXPECTED AND ENCOURAGED TO ARRIVE WITH MEDICAL OR HEALTH INSURANCE COVERAGE IN EFFECT. EACH PARTICIPANT EXPRESSLY ACKNOWLEDGES THAT THERE HAS BEEN NO EXPRESS OR IMPLIED AGREEMENT BY LW TO PROVIDE INSURANCE COVERAGE OF ANY KIND TO THE PARTICIPANT. 5. Photographic Release. Participant, without entitlement to any additional compensation, does hereby grant and convey unto LW authorization to use in perpetuity, and all right, title and interest in any and all photographic images and video or audio recordings made by LW that depict Participant, including but not limited to, any royalties, proceeds or other benefits derived from such photographs or recordings. 6. Other. Participant expressly agrees that this Release is intended to be as broad and inclusive as permitted by law. Participant agrees that in the event that any clause or provision of this Release shall be held to be invalid by any court of competent jurisdiction, the validity of the remaining provisions of this Release shall continue to be enforceable. 7. General LW Program Participation Rules. Participant acknowledges reading and understanding the Participant Rules set forth below and agrees to fully conform to such Rules in connection with all Participation on or about LW operational sites. 1. Only persons within the required age limit are permitted to serve as a volunteer within the LW. You must consult your desired LW center for the age limitation. 2. Minors under the age of 18 and within the required age limit must be accompanied by an adult, or have parental consent and waiver signed. 3. Minors under 18 will only volunteer when someone over the age of 18 is also on shift. sexually explicit, or containing profane or offensive messages. 7. No horseplay or violence. 8. No alcohol or illegal drugs. 10. The Participant shall be responsible for their own transportation to and from the Center or LW activities. IN WITNESS WHEREOF, Participant has executed this Release as of the day and year first above written. Can Liability Waivers Protect House Party Hosts? 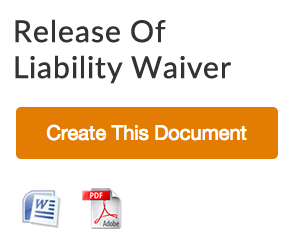 How to Write a Liability Waiver?